Yay, finally something creative is happening around here. Something other than unpacking boxes and assembling furniture. I had to unpack some of the boxes though to find my sewing machine, overlocker and fabric. This is my first Creative Space since moving to Hong Kong a little over a month ago. 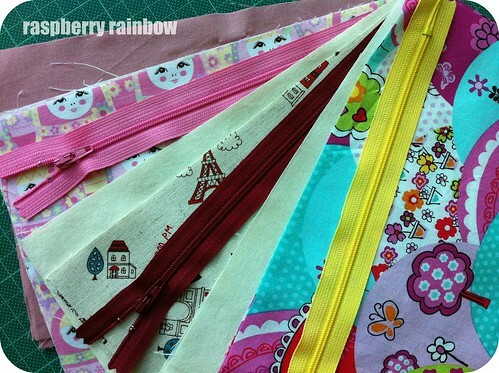 Today I am making more zippered pouches. I have to fiinish these by tomorrow night, so I best be off and get sewing. Pop in and see all the lovely creating going on over here. I have missed being a part of Our Creative Spaces, I love Thursdays! Hi Cat..looks like you've got gifts to make! I'd better let you go and sew. Oh! I have just read the post before this one, so glad to hear that you are back home and getting started on the sewing again and the girls have gotten over the jet lag and are happy and back in to routines, Good luck for your next freebie adventure.